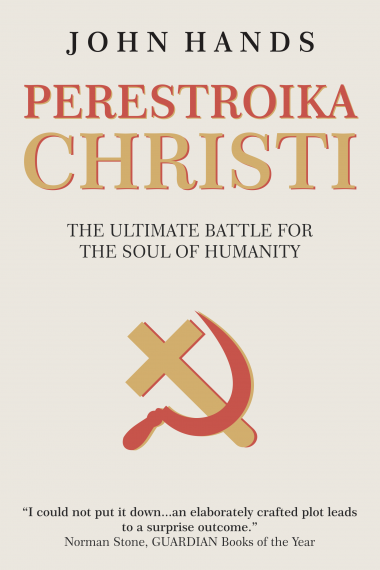 John Hands’s Perestroika Christi is a wonderful thriller and I could not put it down. It is set in the crisscross world of the KGB and the Vatican, with scenes (extraordinarily prescient, it turns out) of Ukrainian nationalism: an elaborately crafted plot leads to a surprise outcome. Unerringly, unerringly perceptive…a splendidly thoughtful novel of perestroika. A most impressive political thriller… I cannot think of another which is both so accurate and in many ways so prophetic. Genuinely scary, exciting, well plotted and nicely written. John Hands’s fast moving first novel explores the penultimate battle, fought with dastardly and Machiavellian brio…read this clever and vivid book. Devilish cunning…ambitions which aspire to the level of Brian Moore rather than Morris West. John Hands weaves an ambitious tale of intrigue…suspense so well built up. A first novel and a remarkable one. Remarkable for its insight into the behind-the-scenes goings-on in both Russia and the Vatican. Remarkable for the quality of the writing. Remarkable for the creation of a believable set of highly intelligent characters. Remarkable for a plot that is very complex but which is presented cogently and clearly at every stage…a formidable achievement. John Hands has his finger on the pulse in his gripping first novel Perestroika Christi. A sound piece of plotting that captures a whiff of Gorky Park but leaves an aftertaste of The Omen. Compelling interest as it reaches its awesome climax. A superb novel, which on one level is a thrilling story of intrigue and suspense, and on another a brilliantly researched and startling exposé of the devious machinations going on in the Kremlin and the Vatican…the authenticity of the background to this fascinating drama is so real it is often breathtaking. Moves from one intrigue or deception to another, and on to an ingenious and disturbing conclusion. One of the joys of reading is that every so often once comes across a novel which begs the reader to absorb concentrated fact amid first rate fiction. Perestroika Christi by John Hands is such a novel…riveting thriller. It comes as no surprise that John Hands’s thriller should have been shortlisted for the £5,000 Deo Gloria prize awarded by the Book Trust…more surprising is the fact that this is only his first novel. A gripping and amazing novel.